Mitchell’s brigade repulses Deas’ Brigade and the Confederates retreat back to their starting point, taking half of Manigault’s Brigade with them. 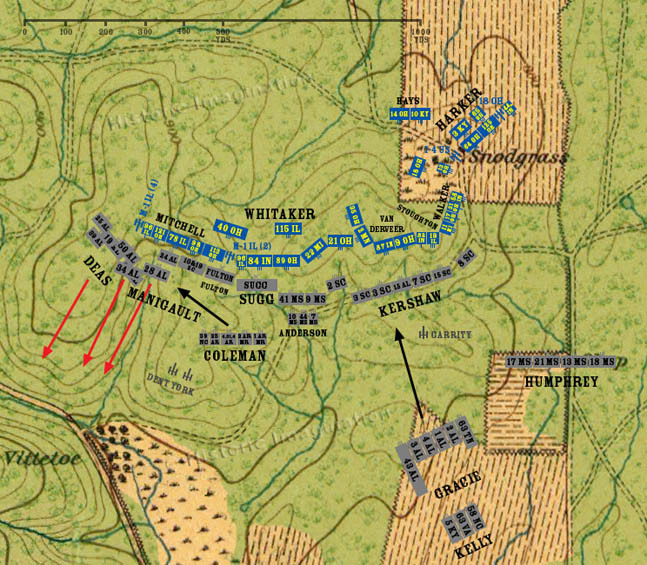 The rest of Hindman and Johnson’s Divisions engage in a fierce fight with Steedman’s division. The fighting rages back and forth several times over the crest of the ridge. Often, the very top of the ridge is a lethal no-man’s land, with the two sides firing at each other from the opposing crests. Individual units, or even smaller groups, will charge across the top of the ridge only to be swept back by fire, or a countercharge. Preston’s Division moves into position behind Kershaw.